Is Art History too big to fail? As a sculptor I have fulfilled the ambition to leave some trace of my passage on Earth but in my activity as art detective, at which I seem to be uniquely able, I have made hardly any mark at all. 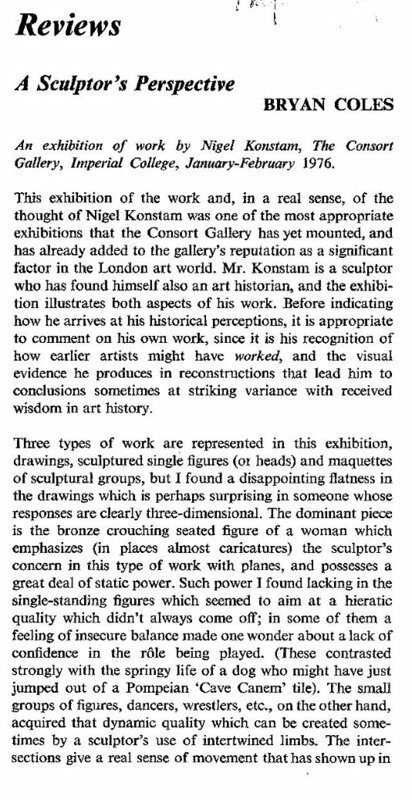 Though I have discovered a number of holes in the web of art history and occasionally published them in learned journals my two major insights have gone unanswered and have had no discernible impact on professional opinion. They are of major importance and I’m writing this last blast to try and push them to public notice. At the age of 86 if I don’t manage it in the next few years I guess they will be forgotten forever. The first discovery was a series of errors in the scholarship of Rembrandt, the most important of masters to generations of artists. My discovery of Rembrandt’s use of mirror images derived from three dimensional groups of live models confirms the unanimous verdict of his contemporaries that “he would not attempt a single brush stroke without a living model before his eyes”. Modern scholarship insists on exactly the opposite: that his narrative drawings came from “an inner vision” but the evidence in the drawings is of groups of recognizable models who worked for Rembrandt over a period of years, creating with their tableaux vivents the subject matter for him and his students for both drawings and paintings. My interpretation is confirmed by geometry and by the inventory of his belongings; we know Rembrandt owned rooms full of the costumes and theatrical properties necessary to create these tableaux. It is necessary to understand the difference between print reversal that reverse two dimensional drawing and mirror reversal which can only be derived from three dimensional objects. 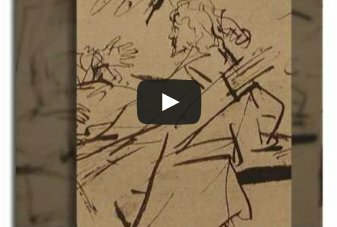 As I have pointed to nearly 100 examples of this in Rembrandt’s drawings (not including the self portraits) a jury would undoubtedly accept these examples as proof, not so Rembrandt scholars. My evidence is more than enough to convince any open mind. The known facts corroborate my story but there is an army of academic theorists whose beliefs oppose the facts with no explanation. I’ve been surprised by the extent to which academic theories win a public and media following over the practical experience of artists. Most of my discoveries have come about because I believe that the art we admired most before modern times was the result of direct observation of life; where the art historians are trained to believe that great art is the result of imaginative invention. Rembrandt recommends the observation of nature “anything else was worthless in his eyes”(A.Houbraken). I follow Rembrandt. Art history used to be written by the practitioners now it is dominated by people whose knowledge is garnered from books, second-hand, rather than direct experience. The Scientific Revolution started when that state of affairs was reversed by observation of the stars. Will there ever be a similar revolution in art history? I doubt it without pressure from the public. These two case histories should provide the stimulus for change but no sign of that yet. The intelligent rule for judging strong evidence must surely be that one accepts it until better comes along. Art historians like theologians seem to stick with ancient books regardless of the evidence – authority rules, OK! 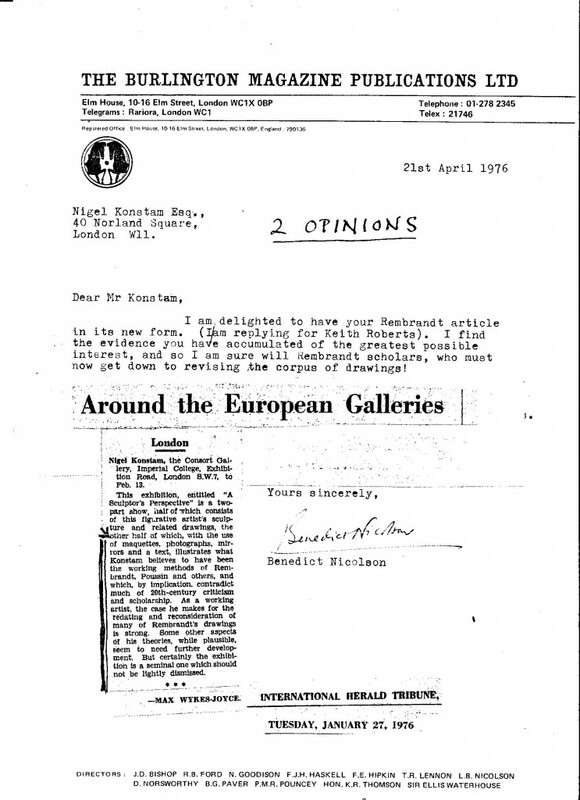 My evidence is beyond reasonable doubt and was published with the acknowledged support from Prof. Sir Ernst Gombrich in the most prestigious art history magazine, The Burlington, (February 1977) and has been ignored or snubbed ever since. (for details of how this was achieved see my article “Barriers to Academic Discussion” in The Journal of Information Ethics, fall 2015. For a brief introduction to my evidence see YouTube, Nigel Konstam BBC, plus many more). The historian/philosopher Y.N.Harari is fond of telling us not to underestimate the stupidity of our species; here is a thriving example of it on a grand scale and in public view for 100 years. How many young minds are brainwashed per annum by departments of art history? Moreover, generations of artists have been deceived about the modus operandi of their chief hero. My recent discovery disturbs the tap-root of European art history and art criticism. The essence of this discovery is that the Romans restored most of the sculptures in the British Museum known as “The Elgin Marbles”. The evidence for this is as clear as day when viewed with the new knowledge of where the smoke pollution came from and how it was trapped by the Parthenon building. The discovery is based on two previous discoveries I made and published in The Oxford Journal of Archaeology in 2002:- a chimney on the Acropolis rock in Athens, and the use of life-casting in ancient Greece (OJA 2004). The evidence is available to all, no special training is necessary and it is on permanent display in the museum at all times. Furthermore, it is a strong argument for retaining the collection not sending the sculptures back to Greece. Instead the marbles become the best place to study the relative merits of the two great civilizations of the past that have most strongly influenced subsequent art. This discovery is a promotion for Rome and a reversal of orthodox opinion since Winklemann. I recently published the full evidence in a booklet “Elgin Arguments” (2018) now also available as an e-booklet. There is every reason to believe that its reception is going nowhere; the establishment has no wish to be disturbed. There is a video on YouTube which is an introduction to the whole idea there is also the illustrated e-booklet, which elaborates on the ideas. (see www.nigelkkonstam.com) Please look them up and add your voice to mine demanding a proper discussion of these important facts that have been misunderstood for 300 years during which Phidias has enjoyed the adulation chiefly earned by the restorations done over 500 years later with superior tools and greater sophistication. An art expert, Richard Payne Knight, made the same point about Roman restorations at the time parliament was buying the marbles from Elgin but he was disgraced for his heresy. The chimney on the Acropolis provides the evidence that restorations were needed which Payne Knight lacked; he relied on style for his opinion now we have soot colour, texture and weathering to add to style. You will need my Guide below to appreciate this to the full. A Guide to how to distinguish Greek from Roman work in the Elgin Marbles, I put no copyright on this description so please send it to anyone who might be interested and take it yourself when you next visit the British Museum. 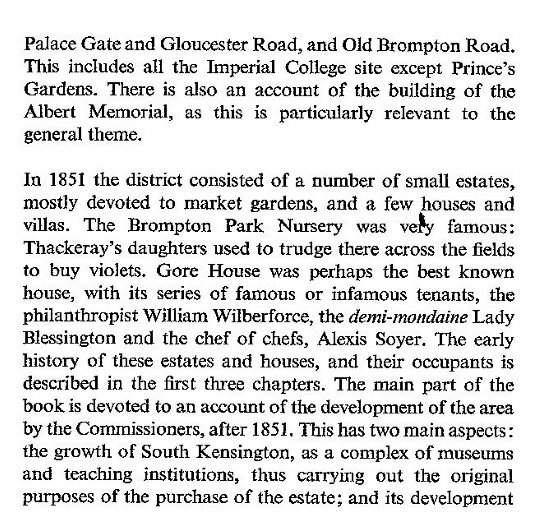 This description goes somewhat further than the original booklet as it compares and contrasts the South Frieze of the Elgin Marbles with the casts of the North Frieze which Elgin brought back leaving the originals in place, clearly because they were not so good. I now believe that the South frieze is mainly Roman restoration as well as the west pediment, both were most probably commissioned by the Emperor Hadrian (117 – 138 AD) that is 570 years after Phidias designed the originals. They are not restorations in the modern sense because they are better than the original work on the east pediment as judged by a series of connoisseurs. The horse of Selene being the one exception on the east pediment, that horse is Roman it is easily distinguished because the original work is blackened by smoke and the Rome is clean shiny marble, furthermore it is in much better condition as it has not been subjected to 570 years of weather and smoke. Compare the horses of Helios with the horse of Selene, both on the east pediment but they could not be by the same author or from the same date; Selene is markedly better and has become the icon of the Elgin collection. This reassessment of the relative quality of Greek and Roman work matters because many of the great masters of the past are much more reliant on Roman geometric form than is now acknowledged – Masaccio, Mantegna, Holbein, Rembrandt, Degas and Giacometti for example. All are based on Roman three dimensional geometry and their achievement cannot be properly understood by present critical methods. Geometric relationships are not read by sensitive lines but by relationships on the page. Art historians have paid little attention to the important Roman contribution to European art though Rembrandt owned thirty Roman portraits and filled two books with drawings of them. Clearly they were a major influence on him. This is why I need public support. It is difficult for archaeologists to admit to centuries of failure to see what is now so obvious. Rembrandt scholars have no such excuse for their continuing denial of what must be clear and proven to the rest of us. 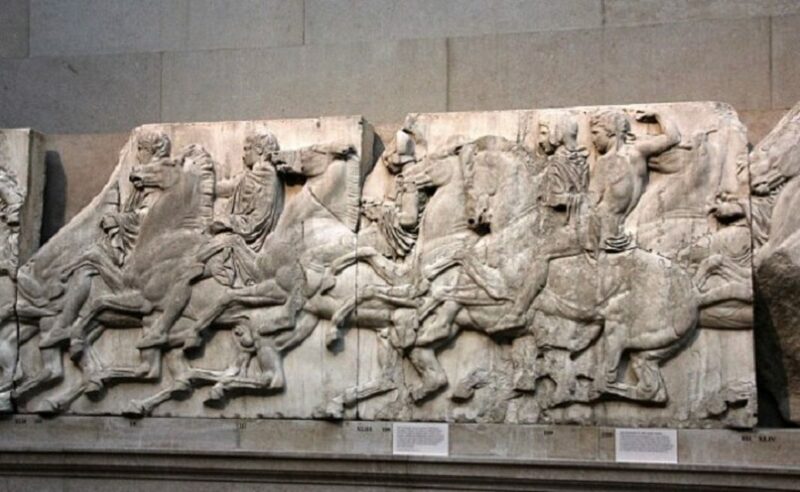 This tour is designed to demonstrate that European Art History is based on an error: the greater part of The Elgin Marbles, all of which were taken off The Parthenon, are nonetheless Roman not Greek. Furthermore, connoisseurs have regularly preferred the Roman work to the Greek. This idea was first proposed by Richard Payne Knight when Elgin was selling th sculptures that he had saved from the ruins of The Parthenon to the government. Payne Knight was disgraced for his heresy but Konstam brings new evidence of an industrial chimney 150m downwind from the west facade, the pollution from which could have so damaged the sculptures that they needed to be restored by Hadrian (117-138 AD). The chimney was discovered by Konstam in 2000 and in spite of his efforts no carbon test has been done on its soot and tar. Such tests could confirm or deny his theory as there is still plenty of black on the original Greek sculpture to compare. 1. Start at the east pediment viewed from afar. Note how all the sculptures are grey with some black in places. The black is mainly coming from below but the black is also in deeply carved pockets where more bruising of the stone has taken place due to the use of iron or bronze tools at right angles to the surface which bruises the marble. This bruising allows the black smoke to enter so deeply into the stone that no cleaning can shift it. This is genuine Greek Classical work. The exception is the horse of Selene on the extreme right which I believed to be Roman and carved with steel tools at an angle to the surface which does not bruise the finished stone. The Selene Horse really looks like marble and is most admired. All are the same Pentelic marble though they do not look it. Note also that the quality of the art is superior to that of the Helios pair (Greek). 3. Look under the knee of Dionysos, the next figure to the Helios horses, you will find areas of black particularly where it overhangs the parapet. Look very carefully and you will find a declivity where the smoke has eaten away the stone under the actual knee bones, note also how narrow the knee has become, possibly because the underside has been reworked as a makeshift repair of the smoke damage. There is also evidence that this figure was copied from a life-cast in hollow wax such as was used to cast the Bronzes of Riace (see The Oxford Journal of Archaeology 2002 “Sculpture the Art and the Practice” for details): the carver has copied so accurately the crude modification made to bend the figure to this new pose that this use of life-casts as lay figures is strongly indicated. 4. Note the black on the lower skirts of the two ladies next to Dionysos. All you have seen so far would have received the smoke collected by the south colonnade as it is in line with these sculptures and is where the smoke would naturally escape. The rest of the pediment is somewhat less blackened because farther from the main stream of smoke. 5. Continue to note grey colouring until you reach the horse of Selene, far right; clean and quite clearly of Roman origin. Although the original Greek version would have been furthest from the source of smoke it would have received that smoke direct in its mouth and nostrils which overhang the parapet and would have been extra vulnerable because of the extra bruising caused by excavating those hollows with iron or bronze tools. 6. Round the back of the east pediment you will note the extra blackening in the deepest holes or valleys explained as above. If this amount of damage was done by smoke here think how much more was done to the west pediment much closer to the chimney plus more direct rain. An early photo shows most blackening on the west facade. 7. As you walk towards the west pediment note the sophistication of the relief carving where sometimes the depth of 3 figures overlap. Some of the horses heads do not work that well because they have not sufficient depth of stone but the bodies are very well adapted to the varying depth of space they occupy. This is Roman, if you wish to see the true Greek relief of the classical period go next door to the Xanthos room there you will see very beautiful reliefs but much simpler. Between these major displays you will see the plaster casts of the northern frieze which Lord Elgin chose to leave in Athens; these are less good Greek reliefs. I have called them naive because the awkward art of relief is no longer following the earlier rules and has not yet worked out the new ones. Block 4 is a particularly crude example of this. Where the Roman horses in the main gallery are remarkably uniform, real cavalry horses, these horses vary from overblown roundabout horses to rather deer-like forms, nor is the anatomy well understood. Opposite this room you will find an excellent video of the arrangement of the south frieze in cavalry ranks indicating yet more sophistication (of Roman work). 8. At the west pediment note all is clean and the surface marble-like because carved with steel tools. The steel tools held at an acute angle to the surface when cutting, does not bruise the stone. The earlier crumbling method (Greek) with iron tools uses the tool at right angles to the surface that bruises the finished stone as well. The bruising allowed the soot to enter so deeply into the stone that even the brutal cleaning of 1938 could not shift it. The finished surface of this earlier carving would have been polished with abrasives but could not have reached the shiny surface of the Roman work. It is probable that Hadrian closed down the foundry if it had not been closed before. Any dirt on the west pediment is the result of ageing. The grave damage is much crisper than that of the Helios horses probably because it was caused by Venetian canon during the bombardment of 1687. Thse numerous anomalies seen in the colour, texture, style and weathering can be best explained by severe damage done by the Phidian chimney before 117 AD and subsequent restorations probably ordered by Hadrian. When you have seen the evidence please leave comments on the YouTube presentation. There is also a colour illustrated e-booklet available “Elgin Arguments” where you can award stars. For yet more detail “Sculpture, the Art and the Practice” second edition, with the Riace Bronze supplement, both are by Nigel Konstam. British historian Nigel Konstam (correction Nigel is actually a sculptor and teacher and founder of the Verrocchio Art Centre) has published a booklet arguing that many of the works stolen from the Parthenon by Lord Elgin in the 1800s are in fact Roman reproductions of the Greek originals. His theory is based on the recent discovery of a chimney near the Parthenon used by the great 5th century sculptor Phidias to cast his giant bronzes. Konstam suggests that the originals had been eroded by acid rain caused by chimney effluent. He argues that the Roman statues were carved differently and look much cleaner than the Greek ones, which were etched (carved) with fragile iron and bronze tools, causing bruising and microcracks which allowed the smoke to penetrate deeper. 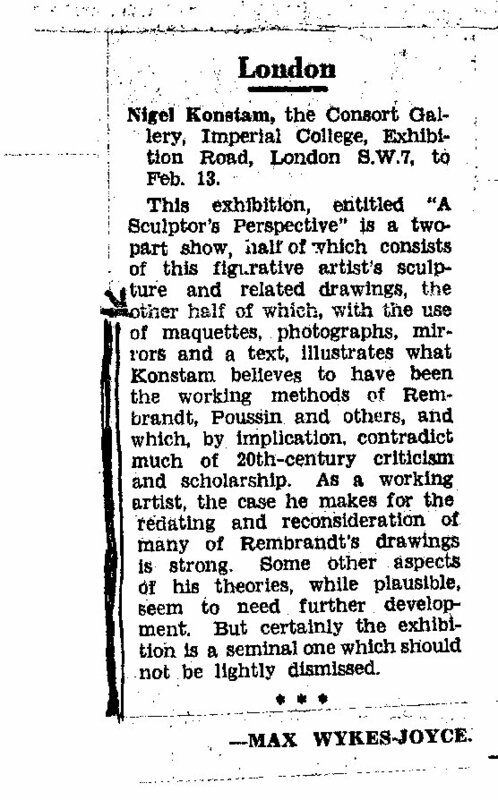 The British Museum’s senior curator Ian Jenkins described Konstam’s theory as “radical”. “I have never heard before the connection between Roman replacements of the west pediment sculptures of the Parthenon and smoke…Nobody been so radical as to suggest that the entire west pediment is a Roman replacement,” he was quoted as saying by the Daily Mail. Lord Bruce a descender of Lord Elgin is not convinced. Speaking to the British tabloid he said he can’t believe there was that much pollution caused by the chimney. “His theory is at least not as ridiculous as one currently doing the rounds that the Parthenon was a burial ground for young maidens,” he added. The word imagination shimmers in the mind along with ‘inspiration’ on a higher level than invention, construction or observation. In the Renaissance and earlier consciousness the true artists were the poets. Painters and sculptors suffered under the lesser designation as artisans/craftsmen. 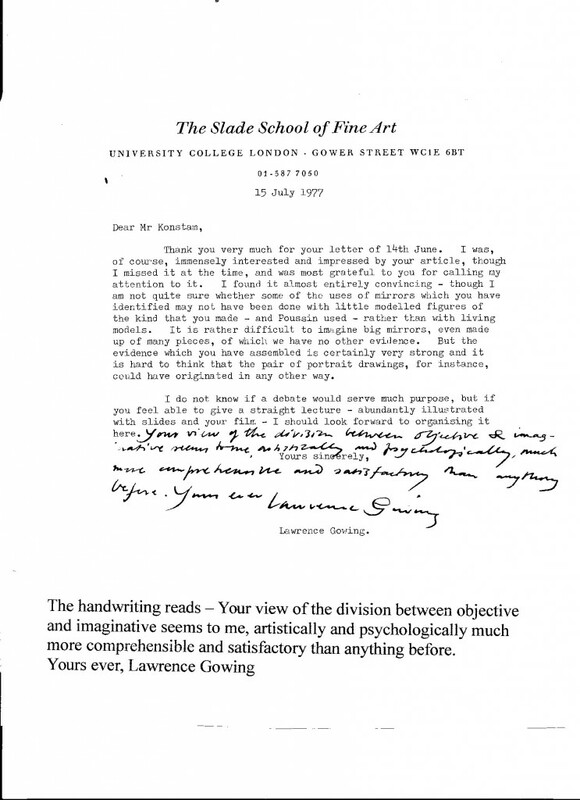 Unrecognised as artists because they were simple copyists, therefore without imagination. Vasari and his artist subjects worked hard to change this by equating their efforts with the imagination of the poet. Thanks to their efforts the visual arts now seem to top the charts as far as prices paid for our products are concerned. But there is a down side. In the arts the word has come to mean working without reference to nature. So the expectation of imagination from the visual arts has inadvertently come to mean fantasy: to out-weigh observation. Whereas what we have actually admired in the past is the vivid observation of nature in which imagination enters as much and as little as in daily life. The patches of light that come to our retina have to be interpreted by the brain, that can only be an act of imagination because they are recognised usually in spite of inadequate data certainly not by perfect matching. Every act of recognition requires memories and imagination. When I look at the chair beside my bed I see patches of dark brown and lighter brown light. The colour relationships remind me of corduroy and my memory of casting aside my trousers allows me to recognise the patches of light as my trousers but there is no evidence in the shapes I see that these are indeed trousers. It is the memory of light on corduroy that has given the clue to my deduction. Every act of recognition could be described as a discovery because we need imagination for the simplest acts that allow us to find our way in the world. Imagination is not rare it is an everyday necessity. When Copernicus discovered that the earth was circling the sun he was using his imagination to see the orbits from outer space. That discovery has shaken the world so badly that had he advertised it he would probably have been burnt at the stake. There is a qualitative and a quantitative difference between my finding of my trousers and Copernicus’ vision based on data that was thousands of years old but not recognised. His was the greatest leap of the imagination made by Man. It has reduced our status from the centre of the universe to a tiny speck in a probable multiverse. The human imagination has grown in status based on Copernicus and his like but it is sensible to regard it also as normal and everyday. We need to distinguish between the low flights of recognition and the high flights of imagination. It is indeed surprising that so many scholars have subscribed to the absurd idea of his imaginative construction for so long in the face of so much contrary evidence, and while doing immeasurable harm to our understanding of the master. My article on Rembrandt’s use of mirrors (Burlington Feb.1977) should have dispelled any remaining doubts about the unanimous testimony of Rembrandt’s contemporaries in this respect. Changing entrenched beliefs requires much patience – as Max Plank observed “science advances funeral by funeral”. The damage to Rembrandt and therefore to art continues unabated. At Harvard the only time we came near to debating the issue – I would claim to have won hands down but clearly the scholars took a different view because they have brushed aside my evidence as if it did not exist. There is no evidence for their view other than the fact that many scholars have accepted it unquestioningly for nearly a century! All the evidence favours my interpretation. In his“Triumph of Art” Part 4 of the TV series Civilizations Simon Schama described Velásquez’ Las Meninas as “a triumph of illusionistic painting”, also, as “a huge brain teaser”. Velasquez himself is “the most cerebral painter of his generation”. Schama asked what is painted on this large canvas we see the back of? possibly the princess or perhaps the king and queen ? “Generation after generation of writers commentators and artists have tried to explain it” but, Schama thinks that “no one has quite got to the bottom of it”. He does not exaggerate the degree to which scholars have found mystery where as a practicing sculptor I have often found a simple, practical explanation for scholars’ mysteries. Of course, it is Las Meninas painted on the front of the huge canvas, self portraits often include the back of the canvas (Las Meninas is approx 3m high). I cannot disagree with his final explanation – the painting is about who is in charge of the way we see but alas my answer is unfortunately the theoreticians, not the painter as Schama implies! My own inquiry started from the question how did Velasquez actually see what he was painting – obviously he needed a mirror to paint a self-portrait. He could not have seen those standing beside and in front of him without seeing them in the same mirror in which he saw himself; so it must be worth asking the question did he actually use a mirror. It would have had to have been a big one, plate-glass did not exist in 1656 when this picture was painted but there was a hall of mirrors in the royal palace in Toledo which Velasquez was in process of transferring to the new Palace in Madrid at the time he painted Las Meninas. Spain had been receiving tribute from Holland and the mirror we see painted reflecting the king and queen in Las Meninas is in a Dutch frame. The same mirror or an identical one can still be seen in the sacristy of the cathedral in Toledo. We would need two rows of four such mirrors mounted together to cover the figures within the subject matter in the painting. But for a Royal Hall of Mirrors that does not seem an exaggerated possibility. Unfortunately there’s no record of the size of mirrors in the hall but the painting seems to represent the room next door (with minor modifications). When we ask the question did Velasquez actually use a mirror? the answer comes back from the painting itself -YES, eight times. 1. Velasquez changed himself to a righthander, 2. he painted the Infanta in the same year with her parting on the other side of her head. 3 the lighting of the group on the left depends on reflected light from the mirror. 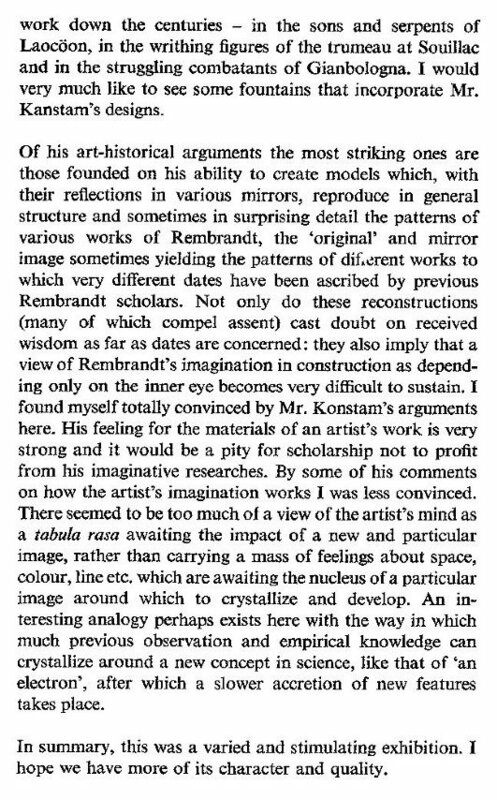 Are these not proof enough that he used the mirror I published these ideas in The Artist Magazine in March 1980 but scholars continue to pursue mysteries in painting, clearly miracles are preferred by them to practical explanations. My straightforward explanation would be useful to artist today who undertake group portraits. 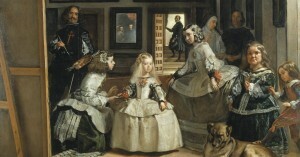 It is a technique which I suspect was used by Velasquez’ assistant for his family portrait and by Goya for his royal group, both artists included a self-portrait. But they disguised their method,. Velasquez did nothing to disguise his method. Art scholars think very differently to artists, they prefer written, cerebral evidence to visual clues; and as they have come to dominate the discussion of art in the media and everywhere else, so useful ideas for artists get lost. There seems to be only a one-way traffic between the theoreticians and the practitioners of art. I have offered similar practical explanations for a number of art miracles many of them are on YouTube (see www.nigelkonstam.com). The use of mirrors by Brunelleschi to invent scientific perspective, by Velasquez as above, by Rembrandt to multiply his subject matter and by Vermeer to augment his use of the camera obscura which I believe he used solely to observe unfocused light. Two mirrors crucially helped him to observe light and allowed him to work in a modest sized studio (3m deep). For artists and those who prefer practical explanations to miracles, I strongly recommend my answers to art historical questions. ). The extraordinary speed with which the Greeks freed themselves from the previous Egyptian formula which had endured 3000 years can be explained by their use of wax casts from life as the basis of their miraculous transformation in both bronze and stone (see The Bronzes of Riace for bronze and Dionysos for stone). These revelations bring the master works to which they refer down to human scale, examples from which living artists can profit. 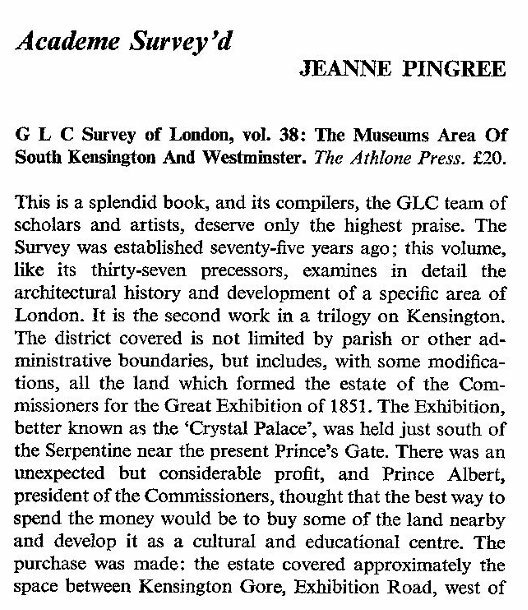 I am still looking for a publisher for all this useful information, I have been looking since 1977.